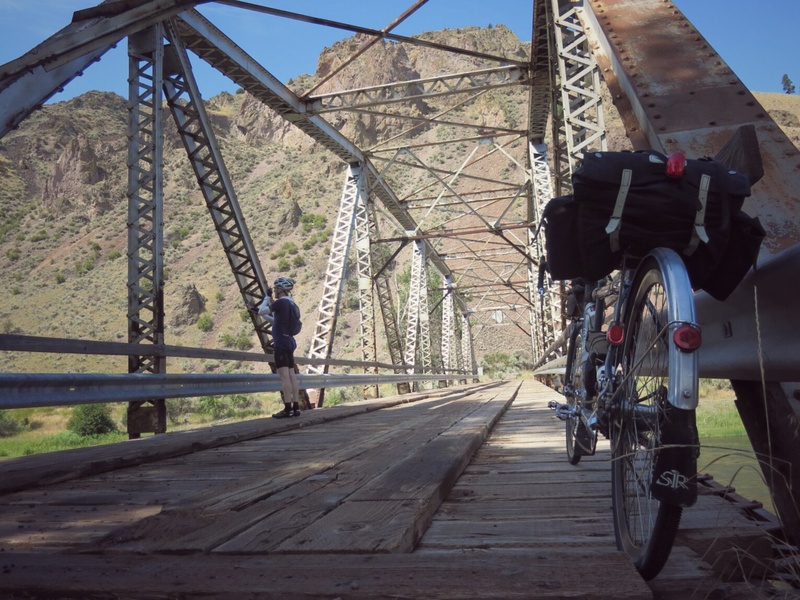 Today’s episode in bike touring found Felkerino and I sidling along the Salmon River for most of the 82 miles we covered. 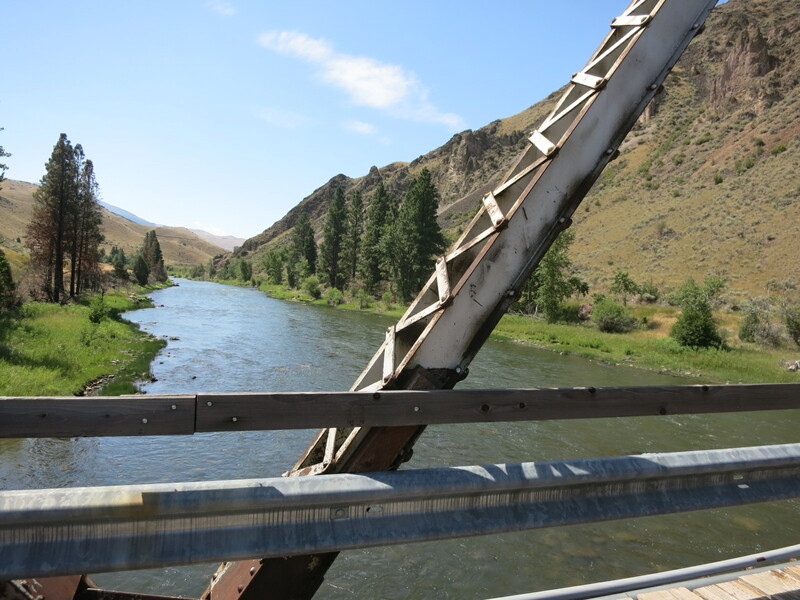 Our route was via highway Idaho 93, but it was quiet except for the perpetual singing of the Salmon River. Now that’s the kind of highway noise I could get used to. I love my Potomac River commutes, but the Salmon River is a completely distinct character. It converses with us as we ride, its flowing water talking just the right amount. The river was largely visible as we rode, and areas beside it were lush green– a sharp contrast to the arid hills enveloping us. For many miles I ignored these invitations. Despite being a Pisces, I’m not really into water. I mean, I shower and stuff, but water for recreation and relaxation is not my thing. But the heat kept rising and the river would not rescind its invitation to submerge ourselves. Finally, Felkerino and I could no longer resist the appeal of cool water flowing over our bodies so we pulled over and dipped our feet in. Heaven. We stopped once more before reaching North Fork, our final destination for the day. Again, pure bliss. My toes reveled in the water’s fresh temperatures. Perhaps I’m more of a water person than I knew. 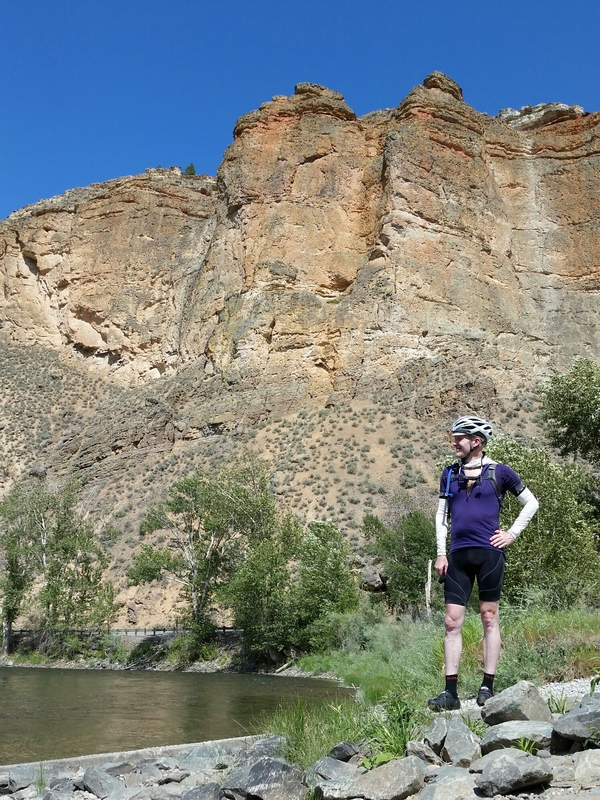 All I needed was the brilliant heat of Idaho and a soft, yet insistent, serenade by the Salmon River to show me the way. I’m assuming (hoping) the Lochsa River — US12 — is on your route. It’s been almost 20 years since I’ve visited Idaho, but I recall being amazed at the drier landscape you’ve described. Still, I thought, it had its interest and finding seemingly random towns and cities situated along a road was a fun adventure (I was not on a bike, but traveling to see if there was a “better place” to finish college). I recall being taken aback the first time I met someone who wasn’t a “water person.” I didn’t realize in my youth that such people existed (I was naive and not well-informed, as is obvious). Growing up near the ocean, I couldn’t fathom that a person wouldn’t appreciate the water, but as I’ve (somewhat at least) matured I’ve begun to understand that just as I don’t have a fondness for certain things, others may not always enjoy the things I do. I’ve always said I wasn’t a mountain person, and yet, here I am, living at the base of some pretty fantastic mountains. I probably don’t appreciate them as much as a “mountains person” might, but I find moments of enjoyment despite my preference to be seaside. It sounds as though you are both having a wonderful time and I’m enjoying reading your adventures along the way. A side question for you, when you have the time: Do you generally fly with your bike (or bikes) when you do your tours starting at destinations a bit far from home, or do you drive? Perhaps you’ve done both? I believe your tandem is a travel bike, if I’m not mistaken, but I’m curious about any others you may have used. I can’t say this trip turned me completely into a water person, but I did become much closer to it this trip than I ever have. All the river riding was so so lovely. This might be worthy of its own post, but we have both driven to our tour starts with our tandem as well as flown. We have a coupled tandem that breaks down into three distinct pieces and technically fits into two airline checkable suitcases (although we use three suitcases for ease of packing). What a beautiful, beautiful river! I spent a few minutes enjoying that first picture, thank you for sharing it!